This is the rainforest adventure of a lifetime set in a paradise of exotic birds and butterflies. 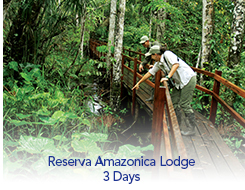 Discover the enchanting splendor of the Amazon surrounded by lush tropical trails, unique wildlife and an invitation to experience a thrilling treetop canopy bridge and a variety of amazing jungle treks. Journey to Tambopata National Reserve offers a range of land and river excursions that introduce you to the magic of the Southern Amazon rainforest. Experience the wonder of this magic place. Create your own nature encounters from different excursions in a range of three intensity levels, some ideal for children, while others are for the more intrepid. Upon arrival, schedule your guided excursions (subject to weather, depending on your desired activity) with an Interpreter, who will also provide basic equipment and snacks.